When we at AEROS began thinking of entering the overseas market with our trike, the existing "Aeros1" trike couldn't satisfy our requirements from a marketing point of view, both because of outside resemblance to the "similar looking" Air Creation trike as well as because of the increased needs of demanding customers. So, a decision was made to refine the existing trike, changing its exterior design and using all the achievements and benefits of the load-carrying structure of the existing trike. With the "Aeros 1" trike, all engineering solutions had been checked and worked out and later they were applied in the "Aeros 2" trike. The tested and proven reliability of these solutions was the factor that gave us confidence enough to start making an export version of the trike and enter the world UL market with a competitive, top-end line of Aeros' products. 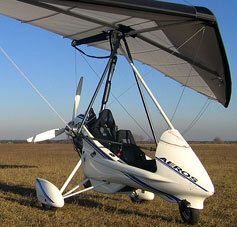 "Aeros 2" is a trike which is now rightly considered an elite product among motorized Ultralights. The mordern design of its fairing gives the trike a classy stylish look, like that of an expensive car. This combines with an excellent flight performance worthy of the best representatives of the new generation trikes. When Aeros 2 was created, our engineers gave much of their attention to ergonomics issues, trying to provide comfort in flight both for the pilot as well the passenger. This has been achieved by the widened seats frame, as well as room inside the fairing for the passenger's feet. A small windshield partially protects the pilot from wind without affecting forward line-of-sight. The instrument panel of the "Aeros 2" is recessed into the fairing and painted with special antiglare paint. We can't help but mention some of the excellent technical upgrades and innovations applied in the fairing of the "Aeros 2". A special beam running longitudinally along the interior of the entire fairing not only makes room for the passenger's feet, but also increases the rigidity of the fairing, which is important for this type of fairing since the surface area is so large. Also, because of our vast experience with trikes, we decided that all fiberglass edges facing the pilot and the passenger should not just covered with rubber, but should be shaped, rolled and folded inside. This is a complicated thing to do in a fiberglass structure, but this profile increases rigidity of the design, as well as providing additional safety for the operators, as they are exposed only to the smooth surface of the edge. The Aeros 2 design is elaborate, proven and ergonomic. 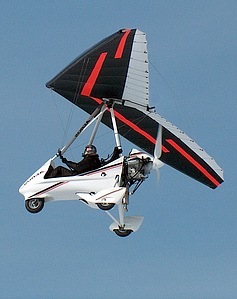 For example, the folding pylon makes it possible to one person hang the wing on the trike without anyone's assistance. With the idea to increase reliability and safety of the design, there is a safety cable inside the pylon. The main landing gear of pyramidal shape combined with automobile shock absorbers makes it possible to fly from and land on unimproved fields, increases safety on rough landings, and makes steering much more comfortable. Utilizing a professional approach of aircraft engineering, the application of certified materials and up-to-date technologies are the domineering characteristics of all AEROS products. The load-carrying frame of our trike is made of rectangular tubes of aircraft alloy D16T 60 x 40 x 2 reinforced by a rectangular tube 54 x 34 x 2; the seat frame is made of the tube D16T 32 x 2. All load-carrying fittings are made according to aircraft technologies of tubes and plates of 30 HGSA steel. This work is done in close cooperation with the Antonov factory and Aviant Kiev plant. The trike wings that are produced by AEROS (Stranger, Stream, Still, Profi) have firmly taken their place in the ultralight market and have made an excellent name for themselves in all possible applications. Click on the wings' names to receive information about them and to choose a wing to your liking. 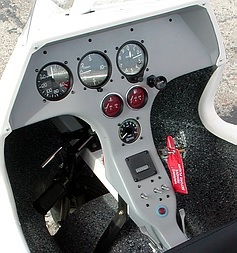 AEROS engineers have designed a range of engine mounts for mounting the following engines applied for ultralights: Rotax 503, Rotax 582, Rotax 912, BMW, Subaru. If a customer wants to have some other engine mounted, a new engine mount can be designed for him. You can order the "Aeros 2" trike in any form, from a kit to the ready-to-fly trike, and of course there are many options for you to choose from. 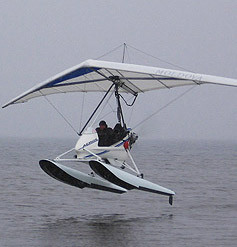 The "Aeros 2" can be equipped with the engine, wing and instruments of your choice, floats or skis, rescue system, etc. On the trikes "general information" page we've tried to publish comprehensive information on making a trike with ultimate consideration of the customer's opportunities and wishes. 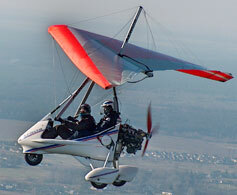 The "Aeros 2" trike with Rotax 503 and Rotax 582 is known at the US market as the Venture 500 and the Venture 600. A Venture report by Dan Johnson has been published in Ultralight Flying magazine - May 2000 issue. Trike "Aeros 2" with BMW engine and wing "Profi"